Hello my lovelies! If you’re anything like me, you don’t like to switch out your purse every single day. I’m extremely fond of versatility. 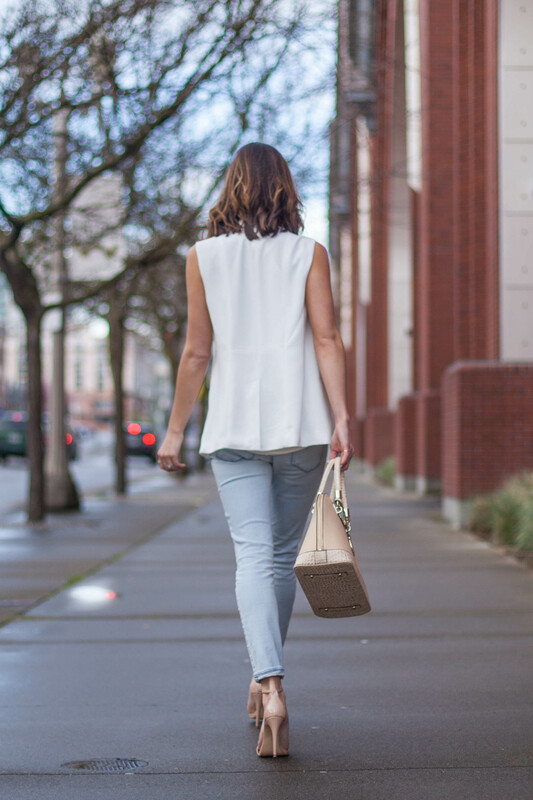 As much as I love to match my bags to my outfits as evident through my blog, so often when I’m running out the door I’m looking for that everyday staple handbag. I only can hope that the bag I was wearing the day before matches my outfit for the day. That’s where the importance of having a neutral color handbag comes in. I’m definitely a fan of black handbags, but I find tan to be even more versatile. 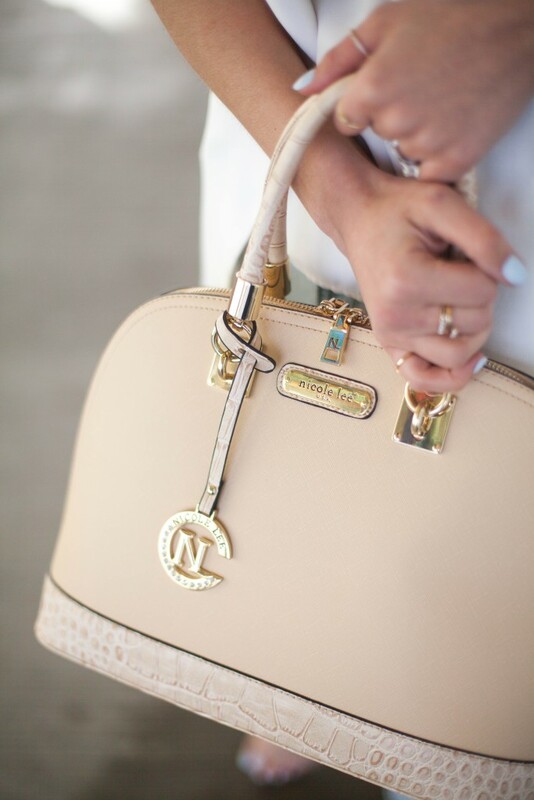 Today I’m sharing why I think tan is the only color handbag you’ll ever need! 1. Tan is neutral and goes with everything. 2. Tan works all year round. I love that tan is seasonless and looks great no matter the time of year. 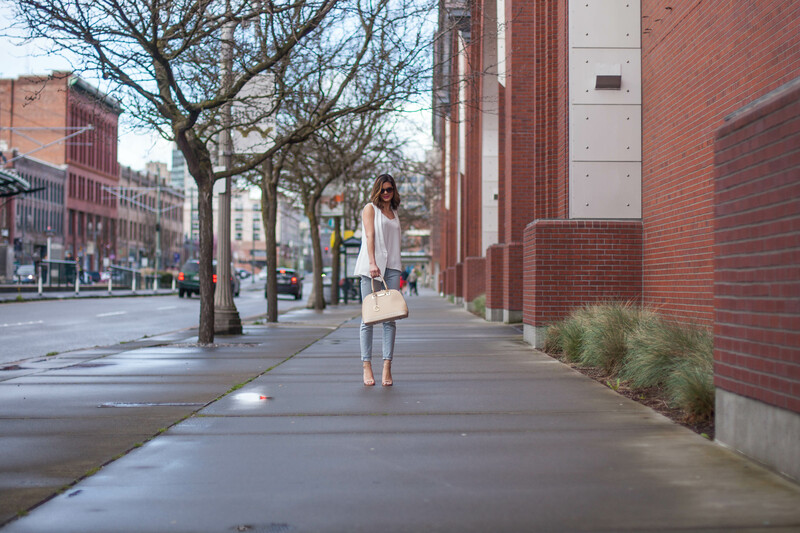 I happen to have more than one tan handbag, so for me it’s fun to bring out the lighter one in the spring and the slightly darker taupe color in the fall. No matter the season, I’m sure your shade of tan will look perfect with your outfit! 3. There are many different shades of tan. With as many different shades of tan that there are, how can you be certain to choose the right one? Well, the truth is my friends, there is no right or wrong answer to this. 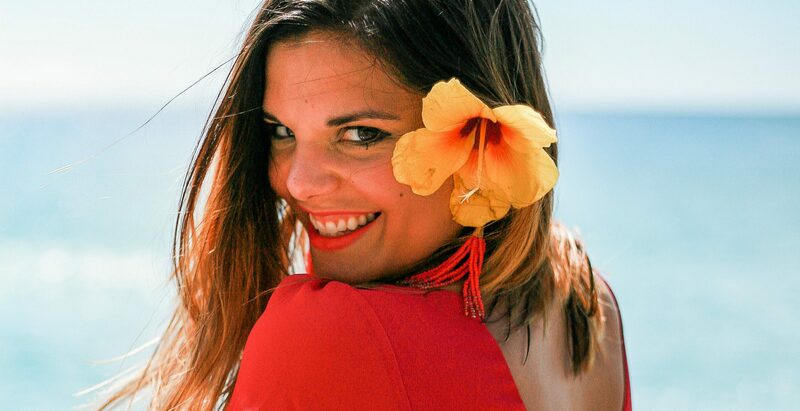 Finding the perfect color tan can be difficult, but I suggest looking at your closet to figure out what shade will match the most items that you own. Do you have a lot of pastels or jewel tones? Do you lean towards autumn colors with yellow under hues? Knowing what you have the most of in your wardrobe, you’ll be able to determine the best shade for your personal style. Style tip: Invest in pieces that have the largest amount of versatility. Because you’ll wear it more, it’s definitely OK to spend more money on it. Spending more on a neutral handbag than you would a colored crossbody or printed clutch is worth the splurge. I’d love to hear, do you have a tan handbag that you love or are you still looking for the perfect one? 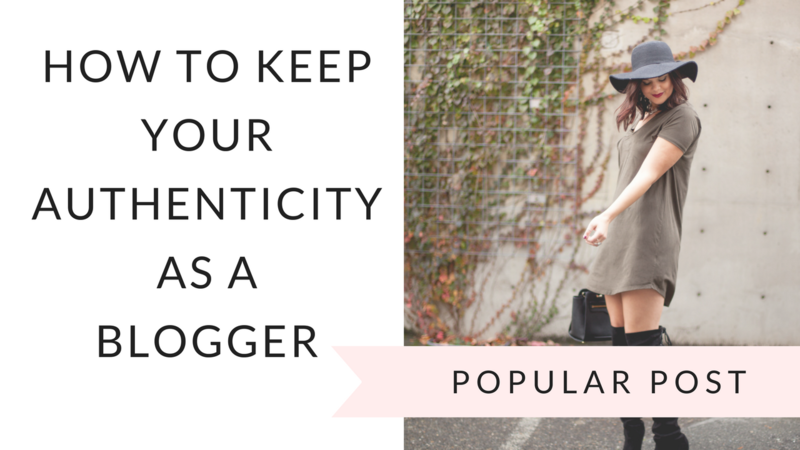 After a little break, I’m so happy to be back to blogging! 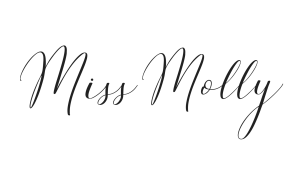 Thank you for your patience and understanding as I took a blogging break. 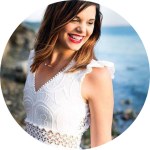 Subscribe to my blog here or through Bloglovin’ so you’ll never miss style tips and inspiration again! Not only is the color stunning but I love the structure. Perfect for spring! Thanks Greta! I such a fan for purses with structure. This bag has it all! Love the structure of the bag! My only issue would be that the straps can’t go over my shoulder. That’s a must have for my bags. This is a good reminder to switch out my black purse for my summer purse this month! I get what you mean! This actually comes with a crossbody strap and I love it! The bag works great for you! I’ve determined that black is still my best colour handbag (at least for fall and winter) but I totally feel you on the clashing with navy lmao. i’m really loving the nudes and blushes for spring. 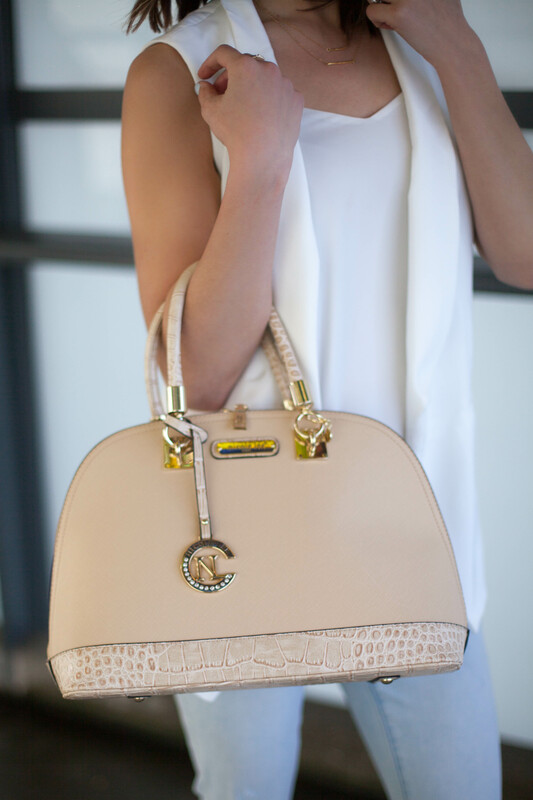 This bag is gorgeous, classic, and perfect! I love your outfit! Thanks Leslie! Nudes and blushes for spring are definitely trending right now and I’m loving it! I love that bag, but my problem is that light tan bags tend to get really dirty (or at least the ones I own!) I own a darker tanish/greenish tote that is my neutral go-to! It hides the stains better! Gorgeous bag! I’m also not one to change handbags daily (how exhausting!). I’ve been carrying a black bag for the last few months and definitely looking for a light neutral update for spring. thanks! It definitely would be SO exhausting if we changed bags every day! Have you found a light neutral bag for spring yet? When you said the only color handbag we’ll ever need, I was honestly expecting a black bag, but this is so much better! I love that color! Excuse my while I grab my keys and run out shopping right now! Haha right?! One would expect black but a tan color is so much more neutral! I love it! I just got a light tan purse at the beginning of the year. But I haven’t used it much because I have been to lazy to switch out my normal black purse(s). I agree though, you have to get the right shade for it to work best for multi-seasons. Isn’t a light tan purse so awesome! Hope you’ve been using yours more! I definitely need to get a tan bag! The color is super versatile. And I love the structure of yours! Thanks Autumn! Loving the structure of this too! Have you gotten a tan color handbag yet!? You are totally speaking my language girl! 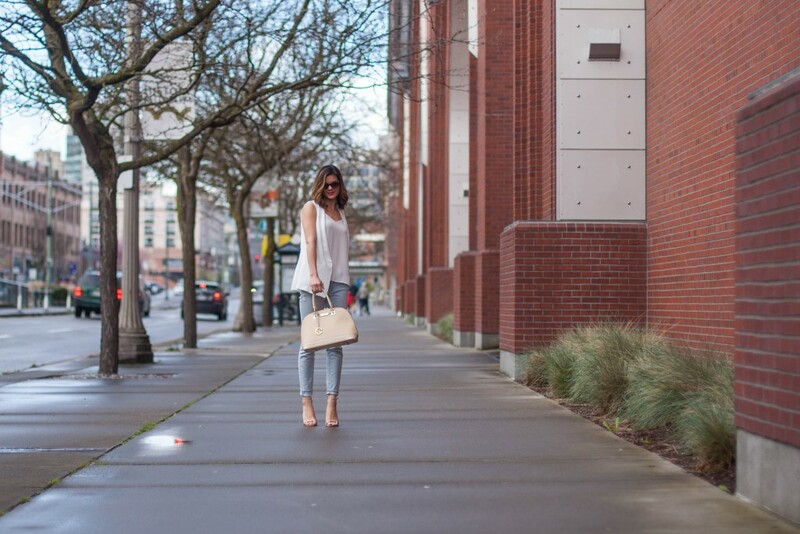 I’m all about neutral handbags! Right?! I love neutral bags so much! I hope you find the “perfect” bag! Purses can be so personal! I agree Molly, tan is so chic and polished. It complements every outfit. Btw, you look nice in this ‘fit. So glad you agree Raven! You’re a sweetheart! Ahhh Yes! Another one of my fashion friends agrees! yes to TAN! 🙂 Hugs to you my friend! I couldn’t agree more, I love a neutral handbag. I have several. Similar to you, I don’t like taking the time to switch out my handbag. I pretty much stick to my tan tote bag 7 days a week. I love this classic and sleek look. 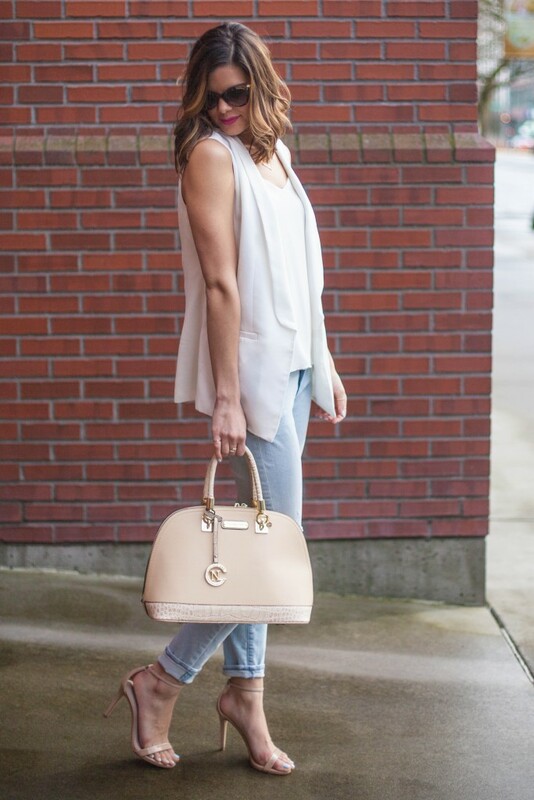 The vest and jean combo are lovely, and your handbag is gorg. I also love your jewerly and bright lippies! Great fashion minds think alike! So glad you prefer a tan handbag too! Hope you’re doing well Asa!